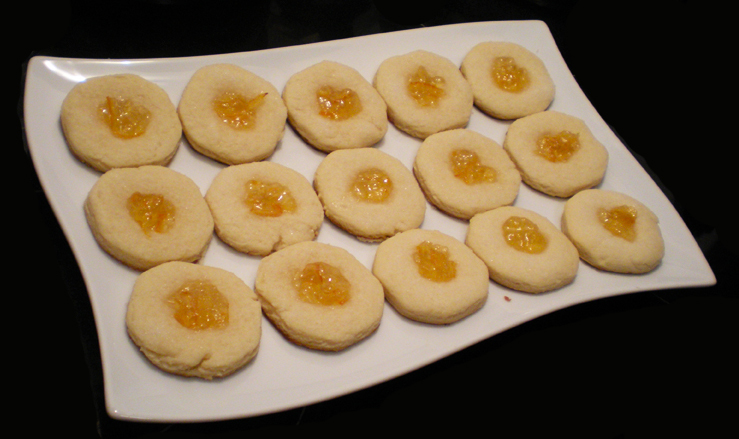 This is a variation of the wonderful cream cheese cookie. Its the exact same recipe, but with some added zing. I love plain old cream cheese cookies so much, I never thought of adding anything else to them until I stumbled upon this raspberry cream cheese cookie from use real butter. So late last night, to satisfy my nagging sweet tooth, I decided to give this cookie a try. When I make cream cheese cookies, I never roll out the dough and use a cookie-cutter. I just take a tablespoon and a half of dough and form the cookie by hand, just because I find it easier. This time though, I rolled it out because I wanted these cookies to be uniformly thinner and a little neater looking than my usual rustic looking cookie. Marmalade of your choice. I used Citrus Marmalade with orange, lemon and grapefruit. Bake at 250˚F for 10 minutes. Before rolling out this dough, make sure you refrigerate it for at least an hour, because the dough it very soft and somewhat sticky and very annoying to work with otherwise. Once the dough is chilled, heavily flour your counter-top and your rolling pin. Roll out the dough until its about a centimeter thick. Now cut out your cookies. *Lightly oil your cookie cutter before use so the dough doesn’t stick to it. I used glass cup with a 2 inch diameter to cut mine out. Place the cookies on an oiled cookie sheet an inch apart. Make little indents in the middle of each cookie. I used a round measuring spoon (1/2 tablespoon). Use anything that’s nice and round and small. Be sure not to press so hard that you go right through the cookie! Now fill the little indents with the marmalade of your choice. Don’t overfill. Use about half a teaspoon of marmalade. Once you have the cookies filled, sprinkle them with white granulated sugar. Bake for about 10 minutes at 250˚F. 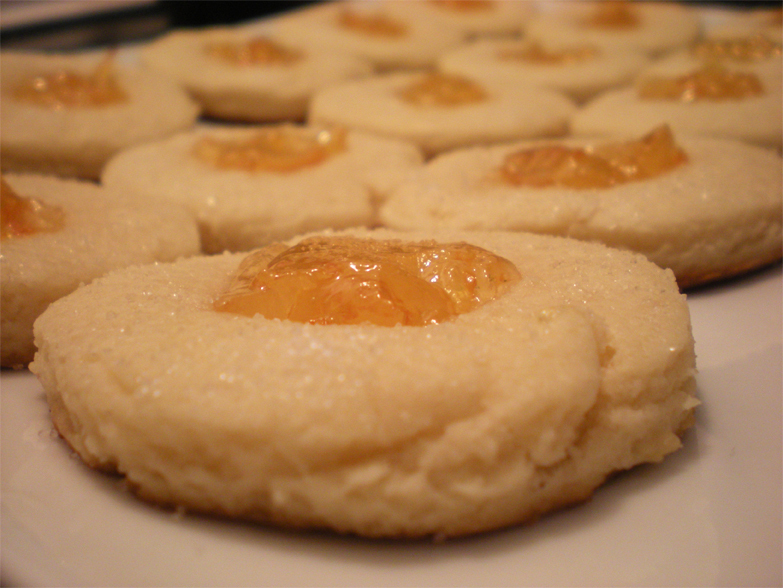 This cream cheese cookie marries perfectly with the citrus marmalade. I especially loved the bits of zest in it. Go on, give these a try. They are incredibly delicious. Next, I think I’ll experiment with coconut…O Boy.